Purchased by Clif’s grandfather, E. C. Clendenen in 1916, the cider press is still running strong. E.C. purchased the press from the Hydraulic Press Manufacturing Co. in Mt. Gilead Ohio. Capable of processing 100 gallons per hour, the Mount Gilead No. 4-C Cider Press allows uninterrupted pressing while the grated apples are prepared for the next batch. This continuous processing minimizes the time that the apple pulp and juice is exposed to air, keeping oxidation to a minimum. The Mount Gilead is a rack-and-cloth cider mill. The operator places a shallow bottomless wooden form on a steel-wheeled cart and lines it with cloth. After the freshly picked apples are sorted and cleaned, they are run through a shredder which grates the apples into pulp. The apple pulp falls into a hopper and is released by the operator into the form. The cloth is folded over the top. The form is removed and a press rack is placed on the pulp-filled cloth. The process is repeated until there are seven full cloths, separated by the racks. This stack, or “cheese” is then wheeled onto the press, where a hydraulic ram forces the cheese against a steel frame. The juice is squeezed through the press cloths and captured in a vat below. Left inside is the dry apple pulp, or pomace. Originally the juice was stored in wooden barrels but today the juice is held in a stainless steel tank and then bottled. The dry apple pomace has been used as food for farm animals, as bait for a trap to live capture elk, and as a medium for growing earthworms. Today it is composted and reapplied to the soil to improve its texture and fertility. 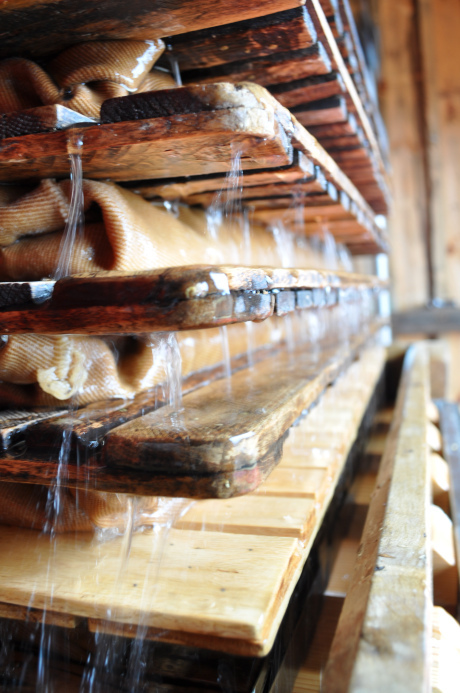 At the other end of the pressing process is delicious, unpasteurized, 100% natural apple cider.